Testosterone: A Wonder for Your Heart! Increase Testosterone and Feel "Like a New Man"
belly fat & 35 lbs. "I’m 51 years old. In just 6 months of using Andro400 I have lost 35 lbs. and went from a size 38 to a size 32 waistline. I have more energy and look and feel 20 years younger! My wife even says that I have to use your product. Thank you Andro400 for my brand new healthy lifestyle!" From 280 to 218 lbs! "I have been on Andro400 since early August, 2014. I have lost 62 pounds and have gone from size 46 waist to size 40. I started at 280 pounds and have gotten down to 218 as of today. I am soon to be 77 years old and still work in my business six days a week. I get exercise from my business but have not done anything out of the ordinary as far as exercise is concerned." Lost 50 lbs. & 8 in. Off Waistline! I was a size 38 waist and I was so unhappy. I hated it – it was not me! Now with Andro400, I've lost 50 lbs., and went from a size 38 waist to an unbelievable 30! I am 56 years old, and feel like I am 25 again! My wife and daughter were in disbelief when I put on my tux I wore when I got married 30 years ago! Exercise used to be a chore -- now I have the energy to jog, exercise and play sports. I'm so happy now! Visceral Fat Is Gone – Now Has an 8-Pack! I've reached my goal . . . I have a flat stomach! Andro400 has been so good to me, I can almost do a commercial. I have an 8-pack, I don't have a 6-pack. I really love the product. It's been great to me. I didn't get it for weight loss, but it's the visceral fat in my stomach I could never get rid of. And now, the visceral fat is gone! Deputy Sheriff lost 51 lbs., same pant size as in high school! I'm a truck driver and spend about 13 hours a night in my truck. Out of boredom, all I did is eat fast food. That was before Andro400 – ever since then my life has changed. I started out weighing 341 pounds – since then I've lost 84 pounds! There's no cravings – I actually don't think about food anymore. One thing Andro400 said on the radio ad is it attacks belly fat – well let me tell you it did – I've lost 6 inches! I'm sleeping better. My knee pain went away. I had back issues and that went away, and I can only attribute that to Andro400. I'm so proud of my look now. This product is a life changer for me! 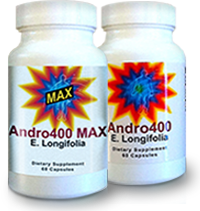 "I've been taking Andro400 for about a year now. I've lost a little over 30 lbs. I have more energy. The biggest thing is just feeling better about myself – a lot more confidence. I'm 54 now and I'm feeling about as good about myself as I ever have!" Losing Belly, Finally Able to Break 180 lbs. Lost 2 inches off Waist, 13 lbs. Without Dieting! 60 lbs. of Fat… GONE! !